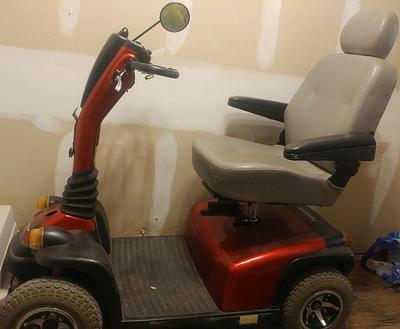 Used 4 wheel used heavy duty electric mobility scooter for sale by owner. 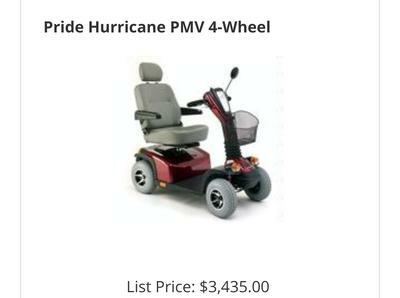 The used Pride Hurricane Scooter is a great chair for getting around outdoors. I have a lift on my vehicle that we use to haul it. 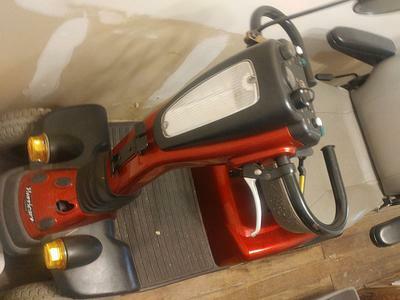 The electric scooter requires a lift or carrier that can handle 300 lbs. weight. The scooter chair has a few cosmetic marks (including the seat that my cat used as a scratching post) but it is in overall great shape. The Pride scooter will come with a (large) battery and a charger. and you will see why this is such an excellent deal for the right person. I paid approximately $3400 for it new and I am asking only $1750 OBO. The We can deliver to areas local to Giddings, Texas TX. I have more pictures of the Pride Hurricane available upon request if you will message me via the comment form below that has been provided by GoGoCycles Used Motorcycles for Sale I will send them to you.